It took Ron Kane a few tapes to turn me on to harmonica trios, but from then on I was sold. His favourite harmonica trio was Jerry Murray’s Harmonicats, and they are indeed worth a hunt. But I soon discovered that there were many harmonica trios making records in the 50’s, 60’s and 70’s. And some were even from my own country. Like The Hotcha Trio! Harmonica music is not popular among the record collectors that I know, and I like to keep it that way. The days that I saw Hotcha Trio records everywhere are long over and the few records that are still missing in my collection should not end up in somebody else’s. Many of the pictures on record covers of Harmonica Trios are meant to be funny. I guess that this is because the music also had some novelty appeal to people. Not to me tough; I like this music because it is wild. At least, I like the wild harmonica records best. And there are quite a lot of them. For my snobby record collector friends I choose “The Aba Daba Honeymoon” . 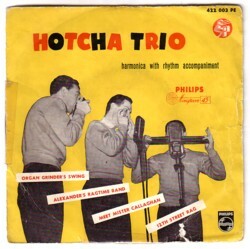 It is one of these tunes that everybody loves to hate, but hear what The Hotcha Trio did with it.